Announced a short time after the Nikon Z 6 and Z 7, the Canon EOS R is a mid-range model and the company’s first full-frame mirrorless camera. Moreover, it features the new RF mount, which at 54mm is the same width as the EF mount, but the focal flange distance is reduced from 44mm to just 20mm, which should pave the way to some very high-performance lenses. For its first camera in the system, Canon has opted for a familiar 30.3 effective megapixel CMOS sensor, paired with a DIGIC 8 processor, which enables a native ISO range of 100-40,000 with expansion to 50-102,400, and continuous shooting at up to 8 fps. As with current Canon DSLRs, the EOS R sensor has Dual Pixel AF, but it surpasses existing models, coming with 5,655 selectable AF points and boasting 100% horizontal and close to 90% vertical coverage. Adopting a weather-sealed magnesium alloy shell, the small SLR-style body houses a 0.5-inch OLED electronic viewfinder with 3.69 million dots, 0.76x magnification, and a generous 23mm eye point. At the rear, there’s a retractable 3.15-inch, touch-enabled 2.1 million-dot LCD. In terms of video, the EOS R can record footage at up to 4K (UHD) at 30 frames per second, albeit with a substantial 1.83x crop. 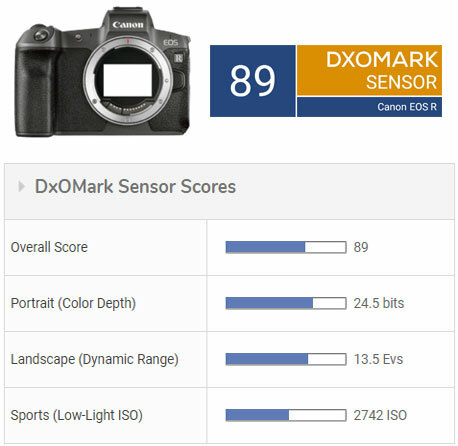 The Canon EOS R’s CMOS sensor achieves an overall DxOMark score of 89 points, which is 29th place among all small- and medium-format cameras in our database. Its key strength is its low-light ISO (Sports) score of 2742 ISO, where it ranks in 27th place overall and in fifth place among the full-frame Canon cameras we’ve tested. Only 0.2 EV (ISO 2742 vs. 3207) separates the EOS R from the best-performing Canon sensor, found in the EOS-1D X Mark II. The EOS R’s (Portrait) color depth and (Landscape) dynamic range fall some ways behind the best in class, but as with its low-light ISO capabilities, its results are among the best for a Canon sensor. Taken as a whole, the EOS R demonstrates impressive gains in performance over older Canon technology, especially when taking the sensor’s Dual Pixel AF architecture into account, which likely limits the sensor dynamics. 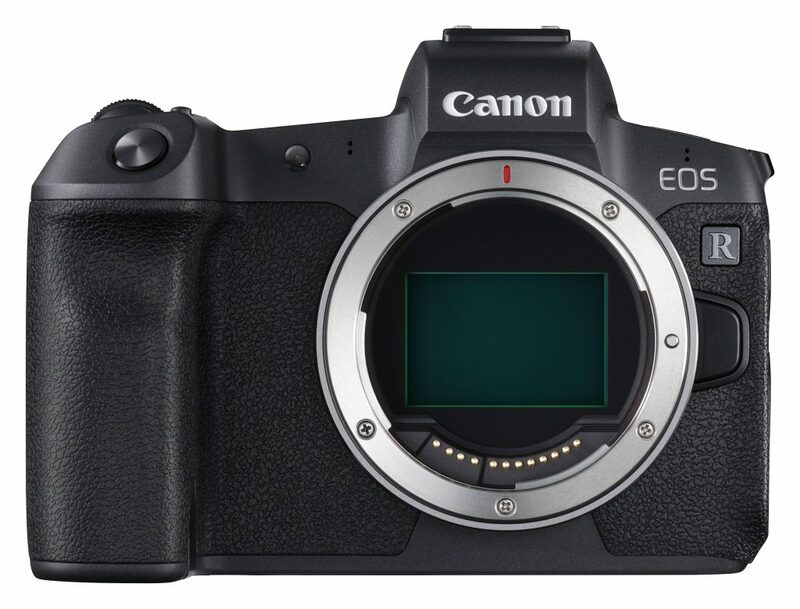 A familiar pixel count of 30MP that’s used only in one other Canon camera currently—the Canon EOS 5D Mark IV—suggests that Canon uses the same sensor or a variant of it in the EOS R. Our testing appears to bear that out, as the EOS R’s sensor results are very close to those of the EOS 5D Mk IV. Comparing the EOS R”s ISO 2742 against the EOS 5 D Mk IV’s ISO 2995, there’s less than 0.13 EV difference in low-light ISO (Sports), just a 0.3-bit difference in color depth (Portrait) at base, and a difference of less than 0.1 EV at the base ISO of 100 in dynamic range (in other words, both cameras have effectively the same dynamic range). As the tabulated results show below, the sensor in the Canon EOS R isn’t all that far behind the 24 MP sensors in the Nikon D750 and in the mirrorless Nikon Z 6 and Sony A7 III. This is particularly true with respect to low-light performance, though out the three, the Sony A7 III performs a little better than the other two. All three excel in dynamic range and color depth. For a more detailed examination of sensor performance, we’ll compare the Canon EOS R to the not-too-dissimilar sensors (in terms of pixel count) of the Sony A7 III and the Nikon Z 6. In contrast to the Nikon Z 6 and the Sony A7 III, which have class-leading BSI sensors that perform very closely to each other throughout the ISO sensitivity range, the Canon EOS R sensor’s color sensitivity is one of its weaknesses. At base ISO, the Canon EOS R’s color depth is 0.7 bit lower than the Nikon Z 6’s, and that gap widens at ISO 800 to 1.4 bits, which is a little disappointing, especially as the difference may be wide enough to be visible at times, such as in areas of smooth transitions. However, at ISO 25,600 and above, the EOS R’s color depth is practically the same as the Nikon Z 6’s. The Sony A7 III, on the other hand, displays smoothing at ISO 102,400, and thus shows a boost in color sensitivity over both the EOS R and the Nikon Z 6. The Canon EOS R sensor just clips our 20-bit good image quality threshold when set to ISO 1600, whereas both the Nikon Z 6 and Sony A7 III dip beneath at ISO 3200, meaning that those cameras have around a one-stop advantage. Similarly, at our 14-bit poor quality marker, the EOS R is the first to reach it at ISO 25,600, with the two competing models doing so around half a stop later. In this review we have compared the Canon EOS R to its most direct rivals from other brands. 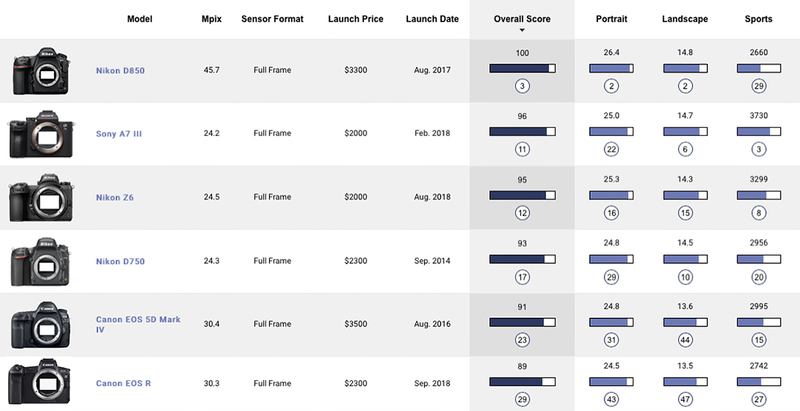 As usual, you can create your own comparisons and in-depth analyses using our interactive image sensor ranking tool.